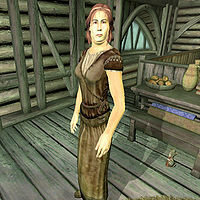 Karinnarre is an Altmer trader who lives with her husband Suurootan in his store Novaroma in Bruma. She was supposed to be a merchant herself, but due to a bug her services are almost never available. She sleeps next to her husband in the basement area below the main trading room every night between midnight and 6am. After waking up, she strolls restlessly around inside the house until noon, when she takes a two-hour walk near the Great Chapel of Talos. She returns to the store at 2pm for some more wandering and once again takes a walk at 6pm for another two hours. She returns to Novaroma at 8pm and spends two hours inside before finally heading down to meet up with Suurootan at Olav's Tap and Tack for a late dinner. At midnight, they both return to the shop and go to bed. On rainy days, she will cancel all her outdoor activities and stay inside Novaroma. The only exception to this routine occurs when Martin leads the allied Army out to the Defense of Bruma, when she is one of the citizens who cheers as he leaves. Like her husband, Karinnarre wears humble lower-class clothing, a belted vest with matching braies and a pair of buckled shoes. She carries around the key to Novaroma and a small amount of gold. The only one of Karinnarre's AI packages that allows her to trade her wares is the one that runs during the Defense of Bruma during the brief time when Martin starts leaving the chapel to when he passes through Bruma's east gate. This page was last modified on 25 March 2018, at 02:58.